Ivan Zelnickova Trump never objected to personifying the salient maxim of the 1980’s, which was that everything worth anything could be bought. Her faith in this dainty precept was even more unwavering than that of the man who underwrote her participation in the decade’s excess. “I want to keep going higher and higher,” Donald Trump once told a bookseller’s convention in Las Vegas, Nev. “And then we die, and nobody gives a damn. It’s all pretty futile, really.” But for Mrs. Trump, there would be no unseemly public wallows in existential angst. Of course, the only person apt to pity the man she called The Donald was The Donald himself. As his apparent victim, Mrs. Trump was the more natural target of sympathy, and in scrutinizing her, the media, which both Trumps so expertly exploited, often succumbed to total myopia. “From attractive to gorgeous overnight,” Lear’s magazine gushes in its May issue, as if, in the Wonderland where the 43-year-old Mrs. Trump plays Alice, there is no distinction between grueling surgical makeovers and the wave of a magic wand. Before boarding the Sabreliner jet that dispatched her on a promotional tour of 11 cities, Mrs. Trump described her heroine, Katrinka, to a television audience. Survival has made Ivana Trump an anomalous figure whose unique privileges merely highlight the unshakably similar ways in which women suffer because of men. This was not what she aimed for initially. Her own inclination was to cloister herself in the rococo world of For Love Alone, whose denizens perpetually fly off to Cap-Ferrat by way of Bremen or glance up at telling moments from their chicken paillard. What must it have been for a refugee from the factory town of Zlin, Czechoslovakia, to arrive alone in the West, an enterprising model who spoke no English and found herself 10 years later in a sanctuary of Meissen lamps and Aubusson carpets where the right and wrong ways to do things are immutable? From the start, it was essential that she seem knowing; but to know, one must learn, and to learn, one must ask. Asking was unthinkable. The entire performance depended on her ability to act as if she knew her part. Ivana Trump possesses many things. A sense of irony does not appear to be among them. I observed Mrs. Trump a year ago in Palm Beach, Fla., at Au Bar, where she was the most celebrated celebrity in the pink and white room. Her eyes were fearful in that nearly bionic face, her expression frozen in the manner peculiar to those subjected to constant surveillance. In public she often seems to be cheerleading a team that consists only of herself, but that night she appeared tentative and strangely capable of being wounded. And yes, one can easily mock her wish to be remade in accordance with an esthetic that attains physical perfection by crossing the Barbie doll with Brigitte Bardot. Yet most women know what it is to gaze into a mirror and yearn to be more lush and firm, and many of these women believe, as Mrs. Trump must have believed, that to amend one’s appearance is to transform one’s life. But life with The Donald did not improve, and it is agonizing to imagine that final, grim year when he was otherwise engaged and she was alone with the perfect new breasts he paid for but told a reporter he would never touch. What did she do in the small hours? Did she pace her triplex’s onyx floors or sit rigid in a Queen Anne chair, staring blankly at the handpainted, gold-leafed ceiling? And that message makes her the unlikely patron saint of every woman who waits for her husband’s car to pull into the driveway or for the sound of his footsteps in the hall, of the women who wait and hope and finally cut their losses and move on. Ivana Trump possesses many things. A sense of irony does not appear to be among them. And so it is left to others to appreciate that, after all her striving to be peerless, the hope she offers is strictly egalitarian: If I can prevail, you can too. That is the essence of Mrs. Trump’s own course in miracles. It may not be true. It need not be true to offer hope. 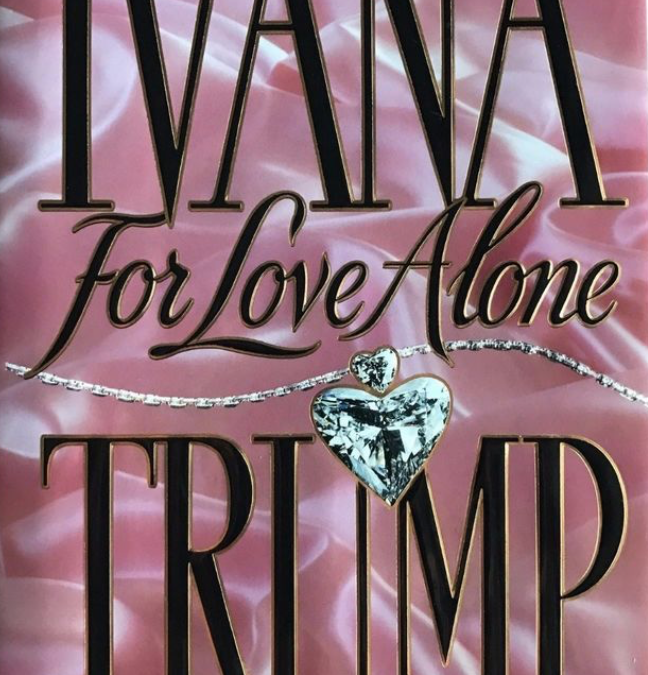 Disseminating this hope to women who flock to her book-signings at the Kmart in Levittown, L.I., and at Brentano’s at Century City in Los Angeles, makes Mrs. Trump the paradigmatic 90’s woman, a decade in which asceticism is much discussed, but not the point. As could be gleaned on Oscar night, witnessing the movie stars whose Armani jackets and beaded gowns were augmented by red ribbons signifying solidarity with people who have AIDS, the 90’s are proving to be less about simplicity than about meaningful glitz. That is Ivana Trump’s dominion, where she presents herself in a gray sheath with hambone sleeves and velvet insets, extolling the virtues of patience and stoicism and certifying that, in spite of herself, she has come to stand for something significant.